"We didn't make this game with the idea that we wanted to make a simplified shooter or a dumbed-down shooter or anything like that," Tsubasa Sakaguchi, a developer at Nintendo recently told me. I wasn't expecting to be having this conversation. I wasn't expecting to ever be talking to Nintendo about an online-focused multiplayer shooter they were making. But I was doing that, because they are. It's called Splatoon. And it's the best answer yet to all the people asking Nintendo to step outside of their comfort zone and do something new. Conveniently and unsurprisingly, their shooter isn't like other people's shooters. 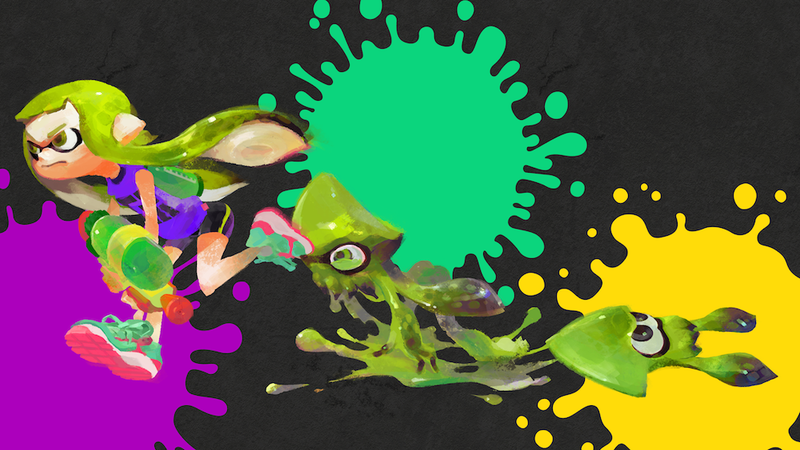 Nintendo debuted Splatoon in Los Angeles last month at E3. I played the game there on a Sunday and, a few days later, talked to Sakaguchi and another developer about it. Splatoon is an entirely original game from Nintendo, though Sakaguchi told me that at one point it had Super Mario himself in there. Now it's got boys and girls called Inklings. The Inklings can turn into squids and shoot, spray and toss paint at each other as part of a struggle to paint the floors of their battlefield with their team's color. Think of it as paintball, if the real way to win paintball was to be responsible for painting the more than 50% of the floor. And if you could turn into a squid, of course. "This game has shooting elements," Sakaguchi said through a translator, "but the main part of this game is the idea of painting that ink... The game is built around the ink and how to use it." With apologies to Sakaguchi, Splatoon sure seems like a shooter to me. No problem there. How Nintendo came to make a shooter and just how different Nintendo's shooter is from others I've played were some E3's better surprises. At E3, Nintendo presented Splatoon across sets of eight Wii U systems, all networked together. The show demo consisted of one level, a long open-air, fenced-in, slightly-crooked rectangular space. It contained a few bridges and catwalks, some hallways on the side and a pit in the middle. The level was designed for four-on-four combat, one color-coded team of Inklings against the other, playing on a timer. The team that had painted more of the floor with their color than the other won. In the match results screen, each team would see themselves referred to as the "good guys," the rival team as the "bad guys." That's cute and very Nintendo. The eight-console set-up simulated an eight-player online match. Each player would see the action of the game on a TV and would see an overhead view of the level layout on their Wii U GamePad controller screen. The level layout would update in real-time, showing all the paint splatter. If you were on, say, the green team and were going up against the purple team, you'd get a sense of who was winning based on which color there seemed to be more of on the GamePad view of the level. At the end, the game would tally it up and declare the winner. Splatoon controlled like a traditional third-person shooter with movement on one stick and aiming on the other, though Nintendo offered tilt control for aiming by default (it was fine, but I switched it off). The action was a little like what you'd get in a Call of Duty or Battlefield. You'd have a tube on your back filled with paint and would be able to run around shooting others with paint. The big difference, though, is that shooting the floor is at least as important in this game as shooting your enemy. The former counts toward a win; the latter just zaps away an enemy player until they respawn and earns you some points to activate cooler paint weapons: paint bazooka, massive paint roller, etc. You also would have paint grenades that would splatter paint everywhere. The thing that the CoDs and Battlefields definitely don't have at all is the ability to turn into a squid and start swimming around in paint. That's a Splatoon exclusive, as far as I know. One button press turns your person into a squid, which submerges them into the ground. Should they submerge into ground covered in paint of their team's color, then they can swim really fast, bounding up and down. Think about the gameplay details I just went through and how they might fit together. Sure, you can run into a match and try to disable your opponents by shooting them with paint. But you could also run around and paint the floors in areas they're ignoring. Perhaps you might get crafty and blaze a line of paint right through the heart of the level, creating a lane that your teammates can squid-swim through. Perhaps your opponents will rush in and paint over part of your line, breaking the lane. And you can paint the walls, too, to help with your squid movement. Painted walls, however, don't count. One of the experiments Eguchi's team considered was made by Shintaro Saito, a Nintendo programmer. It got people excited. "So that prototype was this game where you had four black blocks and four white blocks and they were shooting at each other and trying to control territory," Nogami recalled. "Everyone played that prototype, and we all had a great reaction to it. Everyone thought it was fun, so we decided to present it to [senior Nintendo game designer] Mr. Miyamoto, Mr. Tezuka, Mr. Eguchi and kind of had a few back and forths with them a few times before we got to the point where, 'Okay, we should make this into a game." The painting stuff was in there from the start. The squids were the addition that made things click. That all happened about a year ago. At E3 this year, Nintendo's top game designer Shigeru Miyamoto, whose first big game was 1981's Donkey Kong, referred to the Splatoon team as young. "That's being made by some very young members of the group," he told me. "They're having a lot of freedom to create the game that they want." Youth is a relative concept, and Nogami laughed when I told him that he was being called young. "I've been here for 20 years," he said, "so I don't feel that young." He first worked as an artist at Nintendo. His first big task for the company was to draw backgrounds for 1995's Yoshi's Island. He's been working on the Animal Crossing series a lot since then. Sakaguchi is a 10-year Nintendo veteran whose first gig at Nintendo was making 3D character models for 2006's The Legend of Zelda Twilight Princess. Splatoon is the first game for Nintendo that he's directed (technically he's a co-director with Yusuke Amano, who directed New Super Mario Bros. 2). "Maybe our team might be comparatively young," Nogami said, "but there's a lot of people. A lot of ages." Having interviewed dozens of Nintendo designers over the last decade, I'm going with Miyamoto's view of things. The Splatoon crew had to be the most youthful game designers with whom I've ever chatted. They're not of the Miyamoto/Tezuka/Eguchi generation or level in the company, and they say things that the older guys don't tend to say. For example, when I asked Nogami and Sakaguchi about other shooters like Call of Duty and Battlefield, Nogami said, "We definitely play those types of games," adding "There's definitely guys on our staff who are super into shooters. We definitely play other games and other company's hardware. We do that as part of our jobs and we also do that because we're gamers and love to play games." The team doesn't just seem young but seems a bit raw, which makes Splatoon even more interesting as a new Nintendo game. I got the sense that the dev team is still figuring a lot of things out, which makes sense given that there aren't two decades' worth of earlier iterations to build on, the luxury/curse that the Mario Kart and Zelda teams have at Nintendo. I was nevertheless surprised how much the Splatoon team sounds like they're figuring everything out, especially for a game hatched about a year ago and slated for a release less than a year from now. To wit: their game isn't online-only; it'll have a local one-on-one mode with one player using the TV and classic controller while the other player would be using the GamePad. But when I asked where the map would go, Sakaguchi said the team is "still thinking about how we're going to use the screens." He promised the one-on-one mode "will be its own thing" and won't feel like a "watered down" version of the four-on-four mode. While multiplayer may be the game's main mode, it'll have single-player. Details are scant there, too. Nogami: "One of the cores of playing the game is the idea of switching between those abilities. Single-player mode will center around that. Since we're in development it's difficult to say more than that." They are saying that Splatoon is a full-scale retail game, meaning presumably on a disc, full price and with a heap of content. They may have had one map at E3, but the trailer for the game shows four with three weapons and more of all of that to come. They are hoping that the game is a hit online and that people will enjoy playing it that way. I had a lot of fun when I played Splatoon, and I could related to Sakaguchi's observation about what made him optimistic about the game, too. "For me, what made me realize this could really be something was when we had that prototype and had that four on four with spraying the ink," he said. "I noticed the people playing would all take a different tactic. You might have some person who would just rush to the front and try and attack the other team as much as possible. You might have someone who would hang back and try to cover as much territory as possible. So, when I saw kind of people's personalities and play styles were coming out in this game, even though it was a game built around very simple objectives, [that] made me feel like, ok, this could really be something." The game is certainly a breath of fresh air from a "young" Nintendo development team. Normally I'd say that that's enough and that you should leave the worrying about whether it'll be a sales success to Nintendo. But it really will impact everyone's enjoyment of the game if it launches without an immediately-large online player base. Moreso than any other game I think Nintendo has ever made, it will need that. It's just not designed to be a couch-multiplayer hit. To leave this with some good feeling, I'd like to share Nogami's closing thoughts about the game. As with so many other things said during my chat with the Splatoon developers, his comments were very Nintendo—cheerful...and focused on things that other game designers just don't talk about. 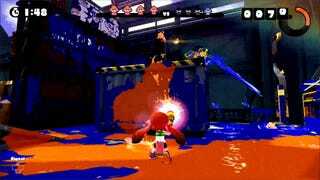 He said this, about the Splatoon developers' priorities: "We want to make sure that action of spraying the ink around feels really really good...Just that feeling of shooting some ink and having it splash on the ground and splatter everywhere and be shiny and be bubbling up, the sound of that the graphics of that—everyone on the team is working really, really hard to make sure that feels really great when you do it." And he said this, looking around at the white interview room where we were sitting: "If someone came into this room and had a paint can and they were like, 'You can paint this room however you want,' I think everyone kind of remembers being a kid and would be like, 'Great, I'm just going to go crazy.' I think if anyone has something like that still left in them, they'll definitely be able to enjoy this game."